When a Highlands Ranch, Colo., woman suddenly veered off U.S. 285, down an embankment and into an aspen grove on the side of Red Hill Pass, she was found five days later suspended upside-down in her car with her feet crushed and her ribs broken — barely clinging to life. Could a highway capable of detecting when a vehicle abruptly leaves the roadway have been able to summon help for Kristin Hopkins within minutes of her violent and undetected 140-foot roll off the pass in Park County four years ago? Tim Sylvester, CEO of Kansas City, Mo.-based Integrated Roadways, thinks his startup company’s “smart pavement” — bristling with sensors and the latest fiber-optic and wireless technology — could be a lifesaver in mishaps such as the one Hopkins survived. The company is partnering with the Colorado Department of Transportation to test a half-mile of smart pavement later this year — at the site where Hopkins’ car plunged over the side of the road in April 2014. It would be the first test of its kind in the United States. The technology is part of the burgeoning Internet of Things sector, a wave that involves autonomous vehicles, so-called Smart Cities infrastructure and intelligent roads that can not only identify and warn drivers of hazardous conditions and sharp curves but also provide an interconnectedness that is increasingly widespread. The firm Research and Markets projects that smart-highway technology, which is in use in various forms worldwide, will grow from a $17 billion industry today to one topping $40 billion by 2023. CDOT is readying a $2.75 million contract with Integrated Roadways to test the company’s technology, which consists of precast and interlocking concrete slabs embedded with an array of sensors, processors and antennae that the company says can easily be upgraded as technology advances. In the case of a vehicle leaving the roadway, weight sensors in the pavement as well as sensors that track location and speed can alert Integrated Roadways’ software that emergency personnel need to be dispatched to the scene. Before full-scale testing begins on Red Hill Pass, probably this winter, Kozinski said a demonstration of just four of the company’s slabs will be conducted this summer on Brighton Boulevard in Denver’s RiNo neighborhood to make sure the fundamentals of the technology are sound. “I want to make sure the pavement operates as intended before I cut a hole in U.S. 285,” he said. The smart pavement would encompass one lane of the highway on the east side of the top of Red Hill Pass, where a switchback set against a stunning view of the high country has made for a dangerous and accident-prone spot for drivers, especially in inclement weather, Kozinski said. “It’s an area of known problems,” he said. 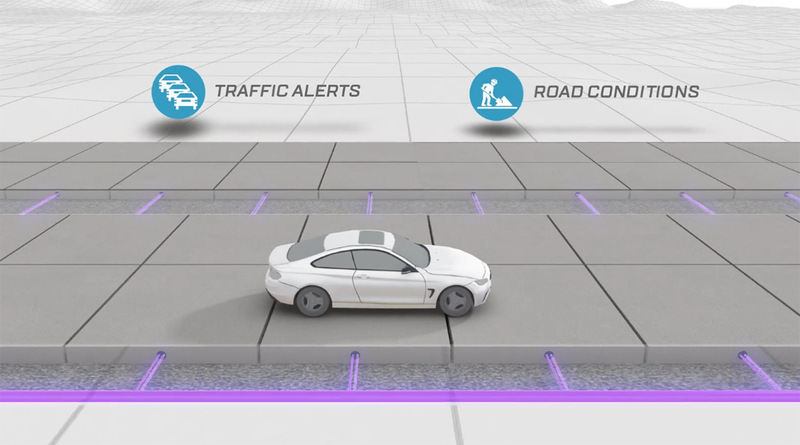 Integrated Roadways’ long-term goal with its smart pavement is not simply accident detection but a network that provides a collection of real-time services — such as road conditions and traffic alerts — to drivers in conventional cars or passengers riding in autonomous vehicles. Sylvester said the company hopes that its road technology will generate business from trucking companies trying to minimize inefficiencies in fleet mobility, property developers seeking high-resolution traffic data and insurance companies trying to pinpoint accident risk with greater precision. Charles Schwartz, a professor of civil and environmental engineering at the University of Maryland, said the cost of rolling out smart pavement on miles and miles of roads in Colorado is the main hurdle to its quick adoption — even if precast concrete panels are cheaper to install than rolling fresh asphalt.